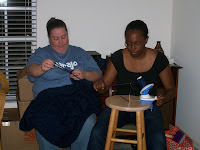 Two afghans are now on their way via UPS to the yarn company. That’s right, they’re DONE! Whew. Shipped a week before the due date, they’ll be there by Thursday. Such a relief to have them done. My contact just wrote and loved the pictures I sent her of them. 🙂 Wanna see? I was going to go to the fitness center at our community center but the migraine I’ve been dealing with all weekend is trying to come back. So instead I’m going to spend the rest of the afternoon relaxing to prepare for tonight. That’s right, tonight’s the night! Tune in at 9pm EST to Getting Loopy to hear about my journey as a new designer. For anyone who’s been interested in learning how to get started, what does it take to do this full time, etc, tune in tonight! Should be a lot of fun. My family has agreed to go to Stitch ‘n’ Pitch with us! And my brother, being the speedy guy he is, already got our tickets. So, three days before I go to conference, I’ll be at the Rays/Royals game. 🙂 Should be a lot of fun. I think my mom will enjoy being able to knit while she watches the game. I just hope that Daddy and Sean don’t feel too out of place. This will be John’s first SnP, too (he wasn’t sure he was going to go, but now he has a ticket, so he has to!). Did you know that this year is the 15th anniversary of the CGOA? Well, it is! And there’s a logo design contest for the commemorative pins that will be for sale at the conference. And I’ve come up with an idea. I just need to sketch it a bit nicer and then scan and upload. That may be what I work on the rest of the day. Now that the afghans are done I will get back to work on my design contest entry and items for Chainlink. Lots to do. I’m almost done with my blue sparkly top. I have it sewn together and just need to do the straps and the edgings. Or, you can go here to the magazine to see a MUCH better picture of it along with a write up. 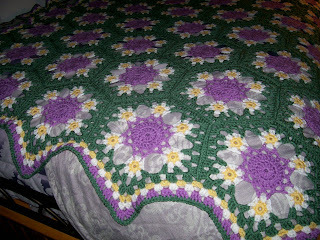 The pattern is called Josalynne’s Garden Afghan and will be in the April issue of Crochet World. I am so incredibly proud of this pattern. It was the first pattern I’ve done that was completely out of my own head. Why did I name it that? Well, when my niece was little she used to pick these little flowers that grew on the edge of the lawn at my parents’ house. They have these dark purple centers with little white flowers around it. They’re very likely weeds, but she would pick a whole handful of them and bring them in the house. One day while walking the dog, I saw the flowers again and thought they might make a neat motif. After quite a bit of swatching I got them to work. The original swatch was done with a very dark purple, but that wouldn’t have photographed well, so the editor changed it to these lighter colors. I think it turned out fabulous. The issue will hit the stands at the end of the month. Keep an eye out! 🙂 I know I will! First off, today’s Memorial Day and I want to send my thanks to not only our service members but also their families. I have seen what a family goes through and how they cope when a loved one is deployed. 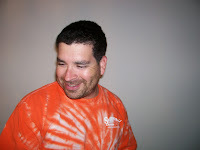 Thankfully, Dani is at home waiting the return of her hubby, Joe, from Gulfport. He got in from Iraq last week and will be home to Florida in a few more days. So, thanks not only to our service members, but also to their families who keep the home fires burning, the kids going to all their activities, and staying sane. 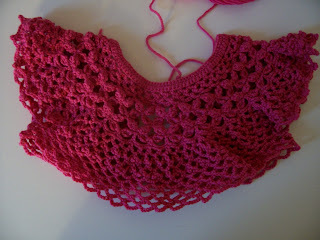 Tomorrow I will get the broomstick lace wrap finished and then try to finish the sample. Then it’s on to finishing the tree skirt. This week will be busy work wise, so I’m going to enjoy the day off. I just finished the afghan I’ve been working on. 🙂 I’m thrilled with how it turned out. All that’s left is to sew on a label. Well, and give it to the recipient. I love this pattern. 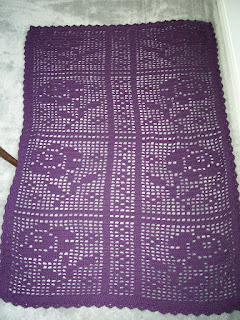 It’s the Rose Garden ‘Ghan in the May/June ’08 Crochet Today. The designer is Katherine Eng. According to my notebook page in Ravelry, I started it on May 1st. Here it is May 17th and I’m done. And that’s with taking quite a few days off from working on it. Had I worked on it each night it would have been done last week. It’s a quick crochet and I think I’m going to make it again in a different color. I agree with the magazine…it would make a great wedding or housewarming afghan. Since we do have 2 family weddings coming up (both of John’s cousins are getting married soon) it may be my fall back pattern. I’ve got a couple other ideas if I’ve got time (ha!) 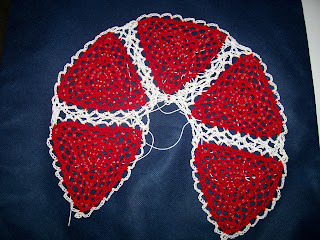 but if not, this will be a quick pattern to do. Wanna see pics? It was hard to get them because the yarn is a very dark plum. All our surfaces here are either dark or covered in cat hair. Since I had just washed it, I really didn’t want to get it coated again. So I picked the one spot in the dining room where the animals usually don’t go. So the color is off a bit, but it shows how well the pattern comes out. Now with that project knocked off my list, I’m back to work on the sample for the store. I’d love to get it done today, but I’m not going to hold my breath. It’s very slow going. Although I am on round 26 of 42. So I could likely finish it this weekend. Okay, I’m going to get back to work and see if I can continue the trend and get something else finished. 🙂 Have a good weekend! I did not get as much done on the wrap yesterday as I would have liked. My wrist and hand started to cramp so I took a break for a couple of hours. I worked on it some more when I got back from dinner with John (he was in charge of cooking and he cooks really yummy Village Inn dinner). 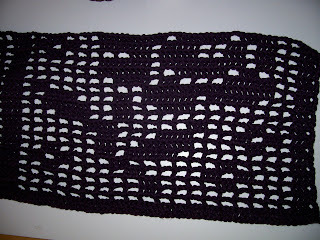 I now have 5 repeats left to do. That’s my goal for today is to push through and get this done. I really want to put this to bed today. Then I can get back to the tree skirt. Margarita should have motifs for me when I see her next week. So I’d like to get caught up on the joining. The weekend is almost here. I’m hoping to finish the afghan this weekend (I really only have the edging left) and get a lot of work done on the sample for the store. I’m going down there on Wednesday night for the meeting and I’d like to take care of delivery in the same trip. Gas is getting way too high to start running around making extra trips. It’s $3.71 at the station we go to down the road. It’ll likely be $4 by Memorial Day at this rate. It’s no wonder John’s taking the motorcycle a lot more. When my stimulus check gets here I’ll be signing up for the motorcycle safety course so I can ride, too. For most of my trips it would just make more sense. Anyway, time to get coffee and get to work. Have a good weekend, everyone! Okay, so I know I didn’t post yesterday. Sorry. 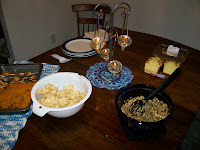 I was wiped from a week straight of heavy cleaning and organizing as well as having people over on Wednesday night (I love having people over, but it wears me out). 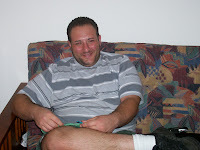 And no, there are no pics of me from that night ’cause I was in control of the camera. Muhahahahaha. I can actually show you this design in progress now as I will always own the rights to it. It’s for a tree skirt and Margarita has been the tester making the motifs and I’ve been joining them (finally got that figured out). It has beads in it and it’s delicate and awesome looking and I can’t wait to see it all done. And yes, it is done in size 10 crochet thread and seed beads. 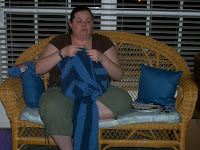 And finally, I started an afghan yesterday. Not bad for about 2 hours worth of work on it. It’s moving really quickly. It’s from the latest Crochet Today and is made out of good ol’ acrylic. It’s a filet piece with roses. It’s not for us, but I can’t go into who it’s for ’cause I’m not sure who all reads my blog. 🙂 But I’m hoping to have it done soon. Okay, so that’s what’s been happening here. I’m taking an easy day today. I may take it completely off or I might work on some work related stuff. Not sure yet. I do know that I have a yummy Guinness roast in the slow cooker (took a beef roast, rubbed Montreal Steak Seasoning on it last night, put it in the pan with a can of Guinness, a splash of vinegar, and a bit of water and let it marinate overnight before putting it on the heating element today….it should be AWESOME). Happy Friday everyone!